The Program Coordinator will be responsible for coordinating, organizing, and delivering initiatives primarily related to cooperative education content and agricultural educators. The position is funded as part of a three-year commitment by the CHS Foundation, to increase youth and teacher awareness of cooperatives. Click here for more information and to apply. Calling all seniors and transfer agricultural education majors. Are you committed to becoming an agriculture teacher? Sign-up for our Tagged to Teach Ag declaration event at National FFA Convention. Click here for more information and to reserve your spot! The FAST Symposium is a professional development, networking and mentoring experience for preservice agricultural education majors. The sessions will focus on creating an inclusive classroom environment, inquiry-based learning, classroom management, professional development, and collegiality. Click here to register by November 2nd. Registration and the NAAE Housing Block are now open. Make sure to book your room soon, as the housing block is filling quickly. Follow this link for more information and to start making plans for San Antonio! Please register by November 15th at https://www.surveygizmo.com/s3/4584026/Lincoln-Electric-Professional-Development-Registration. Presented by Zoetis, the Veterinarians on Call YouTube channel features real-life vets doing a variety of tasks. This week, Dr. Travis Henry and Dr. Molly Rice transport their ambulatory equine dental trailer from their clinic in Wisconsin, to CJ's ranch in Illinois to check on Legacy, an elderly mare due for a six-month checkup. Click here to watch the video. Many years ago I was observing a student teacher in a rural high school in Indiana. In between classes, I was perusing the books on the bookshelf when a book, The Green Hand, caught my attention. I had never seen or heard of this book, and that was after having studied at three different universities and receiving three degrees in agricultural education. Read more. Teachers: Are you looking for an educational resource related to the national convention and expo? Our education team has just what you need. Check out the new National FFA Convention & Expo Educators' Guide. This free classroom resource is for advisors who bring students to the national convention and expo or have students remain at school during the event. The guide also includes a follow-up component for use after convention. Looking for ways to interact with students, work with dynamic teammates, give back to a great organization and learn lifelong career skills — all while working in Washington D.C.? Consider working as a National FFA Conference Facilitator! Applications for positions on the 2019 Washington Leadership Conference staff are open now and close Nov. 16, 2018. We are hiring conference facilitators, a conference director, and an adult program coordinator. If you're interested, apply at FFA.org/careers-at-ffa. Please note that if hired for this position, staff would be ineligible to run for National FFA Office. Check out this link for more about the conference. Should you have questions, contact wlc@ffa.org. Hosting a service event around the holidays? Planning a Martin Luther King Jr. Day of Service event? Now is the time to apply for a Day of Service Mini-Grant! Applications are reviewed on a rolling basis on the first of each month. To learn more about the Day of Service Mini-Grant, visit the Living to Serve Grants website at www.ffa.org/livingtoserve/grants. National FFA is excited to share our new Forever Blue Member Benefits. We have partnered with Access to provide our Alumni members with North America’s largest discount network. Take advantage of savings on hotels, car rentals, condos and resorts. As a bonus, you can make the most of your benefits every day by using your Forever Blue Benefits for savings on thousands of restaurants, retailers, entertainment and more. Access your discounts via the My Deals mobile app or go to https://nffabenefits.enjoymydeals.com and begin saving today. To set up your account, enter 201057 - your FFA ID. You can also use the code NFFA1928 in the travel section to receive a $50 travel credit. Contact alumni@ffa.org if you have questions. Corteva Agriscience (TM), Agriculture Division of DowDuPont (TM), is generously sponsoring CASE Implementation Grants for agriculture teachers and university programs offering pre-service CASE certifications. The application is available at this link and the deadline to apply is October 31, 2018. This is the sixth year in a row this program, formally known as the DuPont Pioneer CASE Implementation Grant Program, has offered grants to public and private schools and universities to assist with the implementation of CASE. Teachers may apply for grants up to $5,000 for implementing the CASE program in their schools, including teacher professional development at a CASE Institute, and purchasing classroom equipment and resources. Pre-service programs may apply for up to $7,500 for hosting a CASE Institute for pre-service teachers. Grant awardees will be announced in December. For questions regarding this opportunity contact CASE Operations/Outreach Director, Miranda Chaplin. Visit the CASE Booth at National FFA Convention! CASE will be located at booth #4627 in Teacher’s World. You can check out the most up-to-date listing of 2019 CASE Institute dates and locations while at the booth. Visit the CASE booth to learn about current and upcoming courses, CASE Online, Lead Teacher opportunities for 2019, and much more! CASE certified teachers who visit the booth will receive a CASE window cling and 2019 CASE Institute pocket schedule, while supplies last! Teachers can participate in a soil exchange by trading gallon size bags of soil with other teachers across the country. Be sure to connect with CASE affiliate institutions, sponsors, and partners who will be recognized across the FFA Expo with special banners. Do you think you have one of the best Career Technical Education (CTE) programs of study in the nation? Apply for the 2019 Excellence in Action award to showcase the amazing work of your learners, instructors, and faculty at the national level. In its sixth year, this award honors programs of study across the 16 Career Clusters® that exemplify excellence in the implementation of the Career Clusters, show a true progression from secondary to postsecondary education, provide meaningful work-based learning opportunities, and have a substantial and evidence-based impact on student achievement and success. Apply Today. 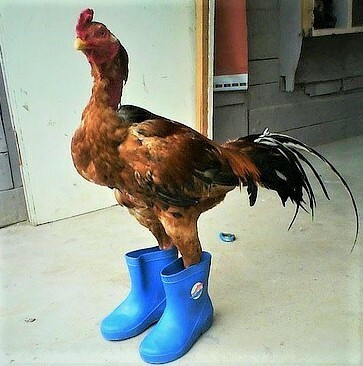 Why did the chicken cross the road—with boots on? Friday, October 5, 2018: Food waste reduction comes in many forms, a new trade deal affects agriculture, and a dog becomes best friends with a koala--these and many more ag/science stories in this week’s edition.